After last night’s cold, driving rain, and a touch of the flu, I need a little reminder of summer. This was taken just after dawn on August 29th in a Wisconsin ditch near Mount Horeb a little east of Taliesin. tilth: The physical condition of soil as related to its ease of tillage, fitness as a seedbed, and impedance to seedling emergence and root penetration. You can tell good soil. A shovel goes into it like butter. This is not good soil. 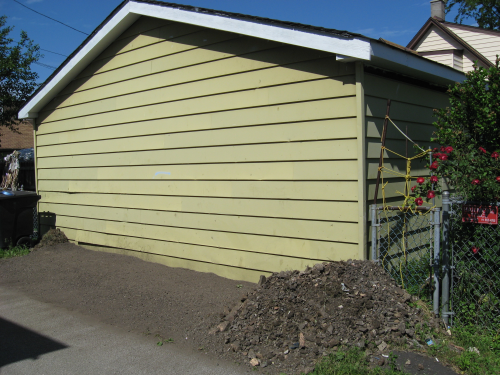 It’s on the west side of the garage, bordering the alley, and it’s a problem area full of weeds. I want to plant it, but if you try to put a shovel into it, chances are you will hit a brick. Or a rock. Or a piece of broken glass. Or a rusty nail. I don’t think it’s impossible soil though, because it’s full of earthworms and nightcrawlers, which aerate and fertilize the soil, and give it tilth. Before anything else happens, the rocks have to come out. 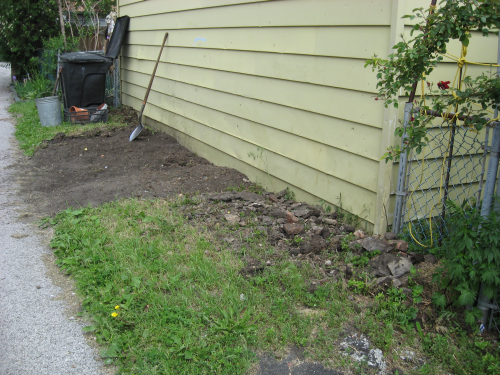 Last week I mowed the weeds, so now I start removing the top layer of turf and weeds. 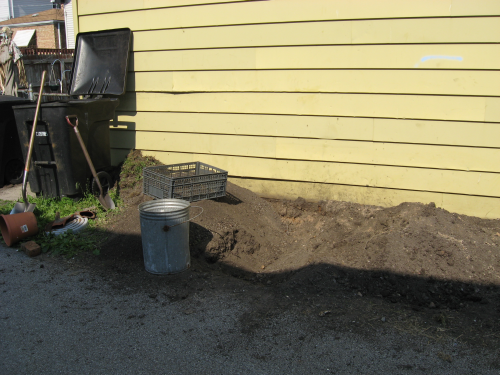 There are too many rocks to just pick them up and put them in a pile, so I devise a system of shaking the soil through the holes of a plastic crate. The rocks are caught in the crate and I dump them in a small garbage can. When the can is full, I carry it to the newly created rock pile. The sun gets lower and lower in the sky. The shadows creep up to where I am working. Then, it’s dusk and the street lights come on. This isn’t rocket science, so I keep working in the dark. The next day, it’s ready to plant. 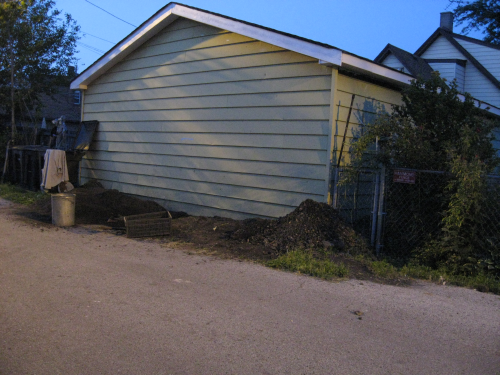 Except for the small problem of the new rock pile. Can you garden and blog with the same pair of hands? I don’t think so. Even though I had leather gloves, my hands are scratched and infected. I’m not anywhere near done either. Why was it again, that I left Wobegon and came to the Big City? Time for a little Sandburg. Poem: from “The Red Son” by Carl Sandburg, in Chicago Poems. Supposedly, in Illinois you can add one day to the growing season for every 7 miles south traveled. So if you travel south 100 miles, you should see plants that are 2 weeks ahead of your own area. Of course we have had cold rainy weather, but still, my hostas are only an inch or two out of the ground. Will they look like these in another 2 weeks? And what about the flowers? A while back I was planning a garden in the back of the house. Today it’s finished, even if a little worse for the frost. The square thing over the sewer lid cover was an addition by the landlord. It’s an old concrete post support that we dug out of the side yard a few weeks ago. He says it’s to keep the kids from messing with the lid, but I think he just likes it. UPDATE: an experiment in proportions. Of course it always look different when you actually put the shovel in the ground. I’m sort of leaning towards the last one, a sort of trapezoid, since a tiny strip of grass by itself is hard to maintain. One of my childhood heroes was the criminal defense attorney Clarence Darrow. 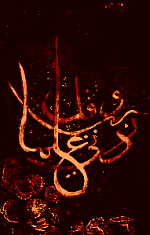 Beside being a notorious agnostic (and writing an autobiography that was the first book I read in the sixth grade when I was admitted into the adult library by special dispensation, having read all the books in the children’s library) he also defended Leopold and Loeb (wiki) who were convicted of murdering a child and stuffing the body in a culvert. 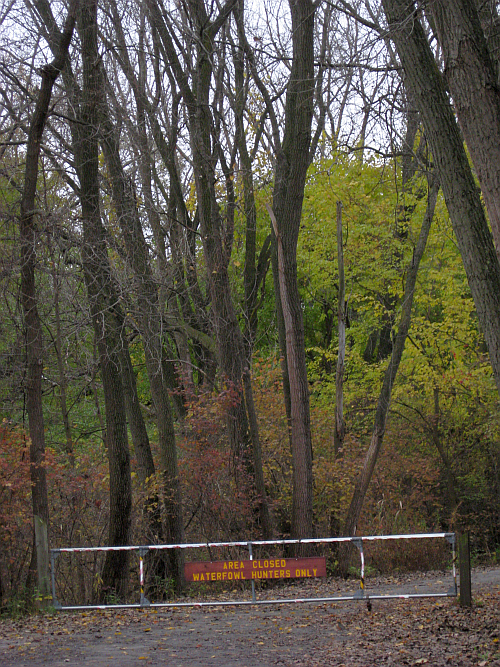 Some time ago, when googling the Nike missile site at nearby Wolf Lake (map), where I often walk, I became aware that Wolf Lake was also where Leopold and Loeb disposed of the body in a culvert. Yesterday I went for a long walk after transferring the new Leonard Cohen London concert album to my new mp3 player, and just for kicks decided to see if I could find this notorious culvert. 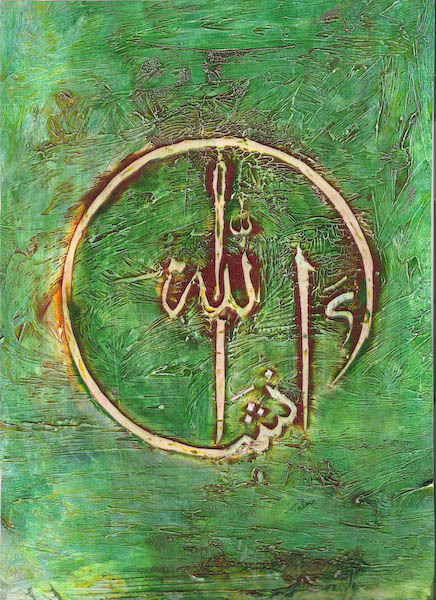 Here are the clues. 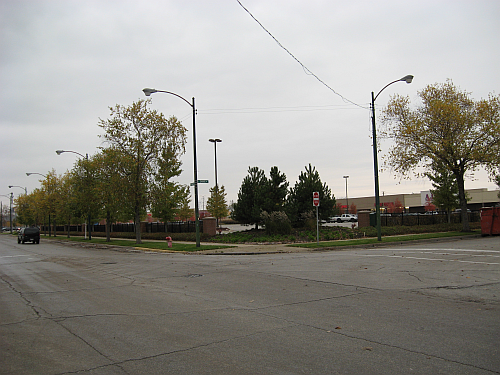 The location is described as being in Illinois, near 118th street, near the Pennsylvania Railroad tracks, and on the north side of Wolf Lake. Also they moved the body with a car. 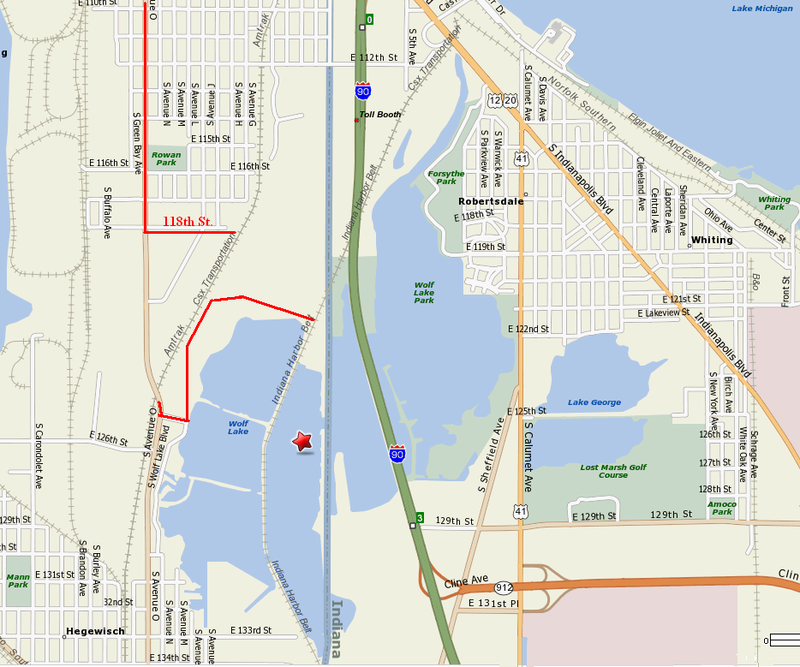 Looking at a map, we see only two railroad tracks on the north side of Wolf Lake, one accessible by 118th street and one by the access road that goes around the west side of the lake (not on the map). I have marked the two possible routes in red. So now, to the park. 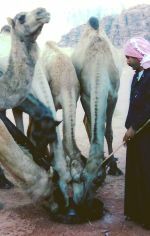 I have never seen this before. Why does it make me nervous? 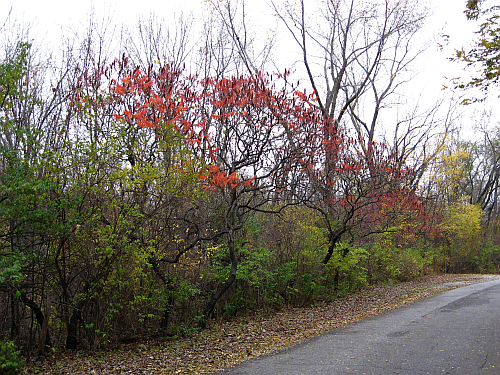 There is still some fall color, even though most of the leaves have fallen. The sumacs are the most spectacular. 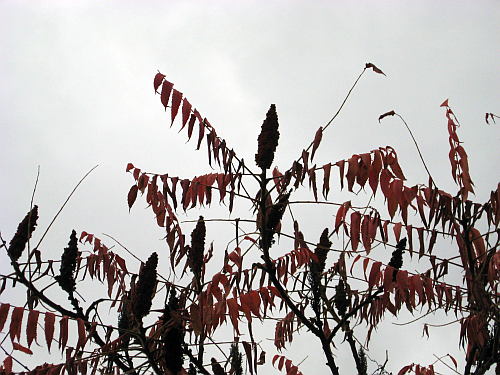 I wonder if this is the same sumac the Arabs eat as a seasoning. but when I get to the crossroads, hoping to investigate the railroad tracks nearest the Indiana border, I am met with a road closure. 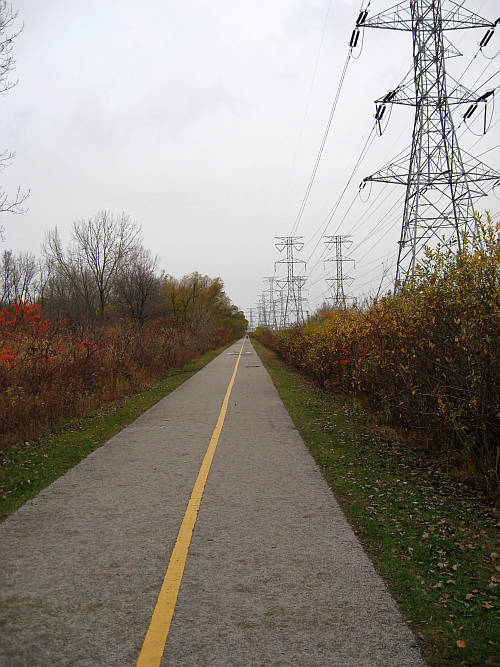 I have no desire to meet up with hunters carrying guns of any kind so I climb the hill to the bike path to the west. 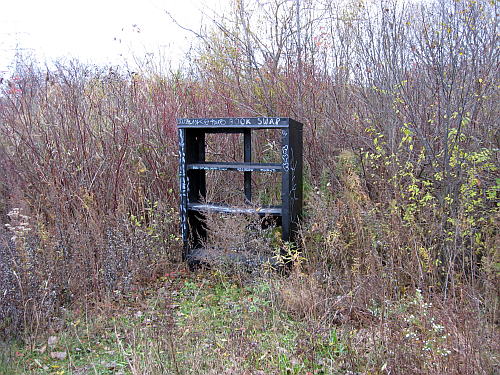 The book exchange is still there, but no books today, not after two weeks of rain. Finally I reach the turnoff for 118th street. 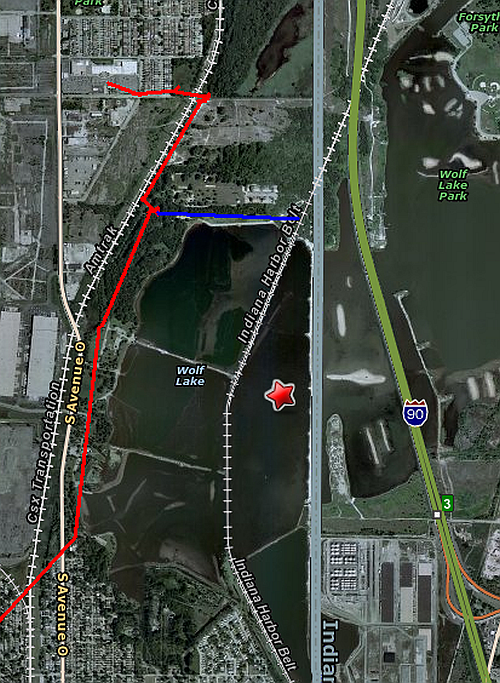 And not wishing to run into duck hunters on the north side of the lake, I head towards the western exit. This leads out to a supermarket and a few shops. Here the frost has not touched anything. 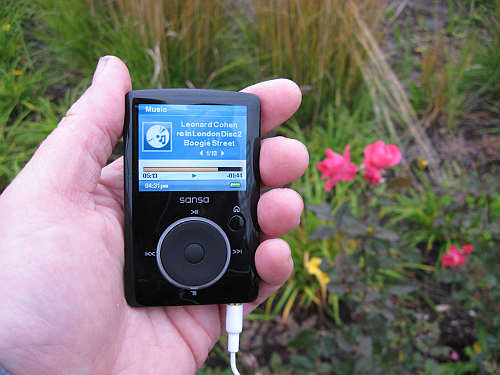 Roses are still blooming as I reset my mp3 player for the return trip. 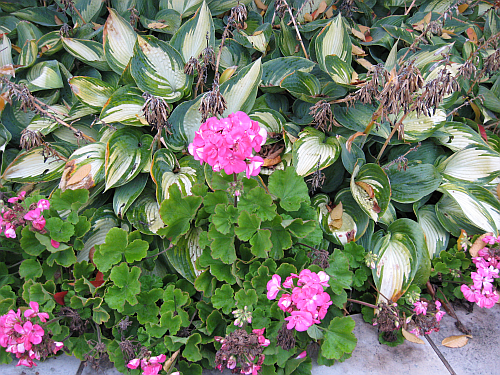 Geraniums and hosta are still green here, but at my house they’re yellow from the frost. 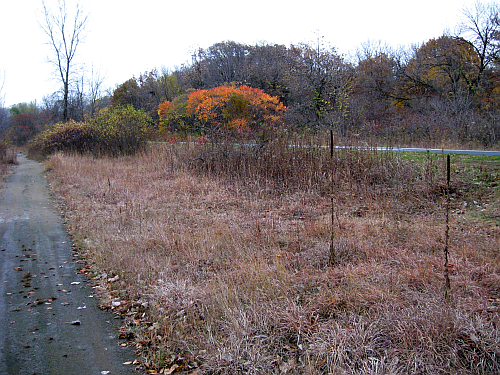 The map showed railroad tracks between the lake and 118th street, but I didn’t see any. On my return trip I see what has happened. 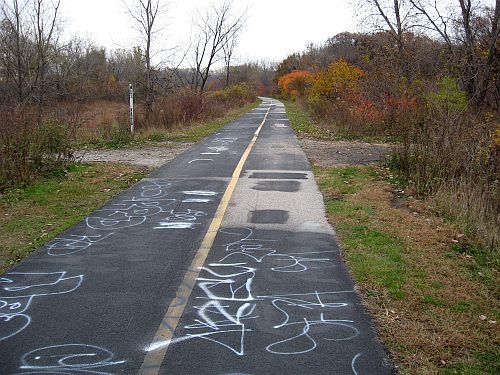 The old railroad right-of-way has been used to make the bike trail, and our infamous culvert is no where to be found. But there’s no reason I can’t do a little moss gathering. 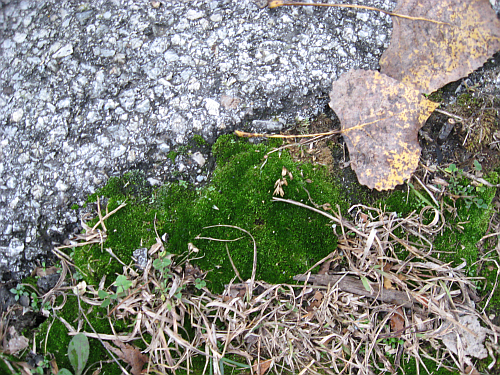 I having been keeping a lookout for moss, and here I finally find it on the west facing edge of the bike trail. 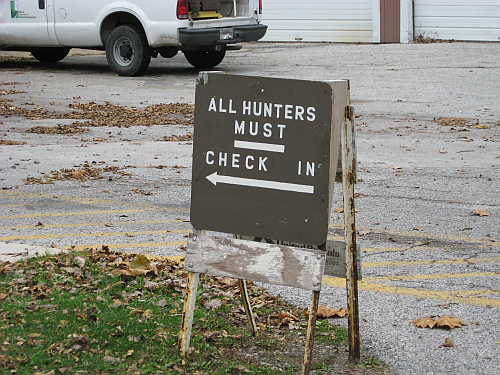 Alas, it’s public land, so I will have to leave it undisturbed and enjoy it right where it is. 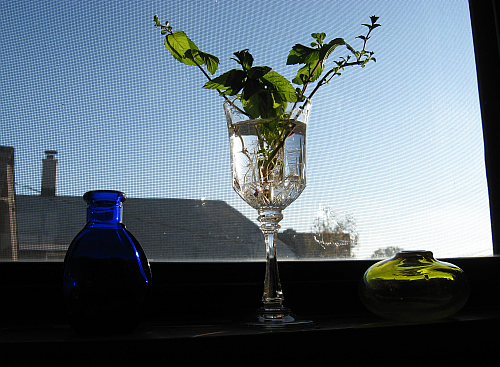 Here is what is in my windowsill at the moment: mint cuttings with roots. 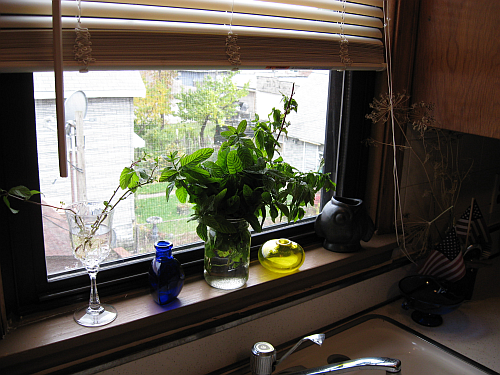 UPDATE: a stop at my mint patch across the street, and the cut mint for my morning tea is now replenished. As you can see, I have also been to the local thrift shop and found a small piece of Oaxaca pottery, the kind that looks like it was made from pencil lead, and also a blue glass bowl, probably depression glass, that looks vaguely deco. 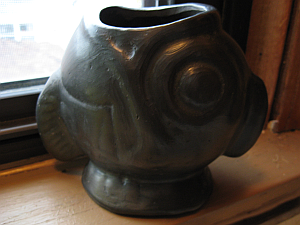 Further research tells me Oaxaca pottery is purely decorative, and since a low temperature firing method is used to get the black color of the clay, it’s too porous to hold water. It’s so whimsical though, I love it. 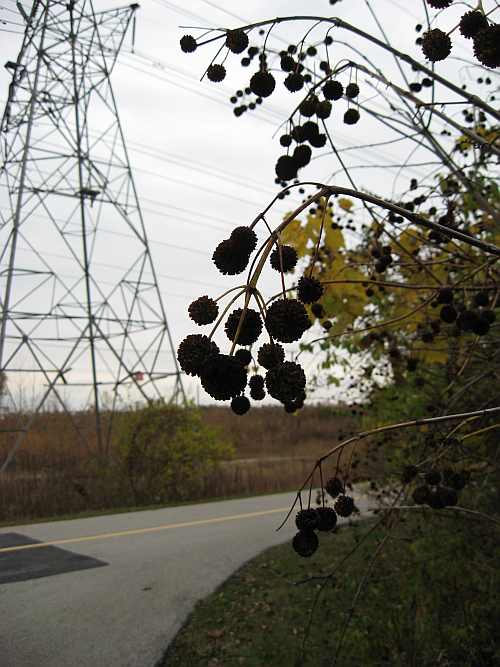 Walking along the railroad tracks at twilight, I found a few of the plants that ordinarily have drab fall colors take on a striking appearance in that light. Unfortunately, they don’t quite fit any of the vases I brought home. I love seeing bits of the outdoors inside, but that project will have to wait for later. The sun has finally come out and the garden is dry enough to work. Time to finish transplanting, before the frost they are promising for later in the week. There are those who say Americans don’t know how to garden. Not true, although the climate here is not as temperate or favorable to some plants as countries that enjoy the warming influence of the other side of the Gulf Stream, and the typical American neighborhood doesn’t look as landscaped as European ones. Someone once remarked that Europe looked “finished”. American is far from being finished and someone with the itch to play with landscaping materials will find plenty to do. 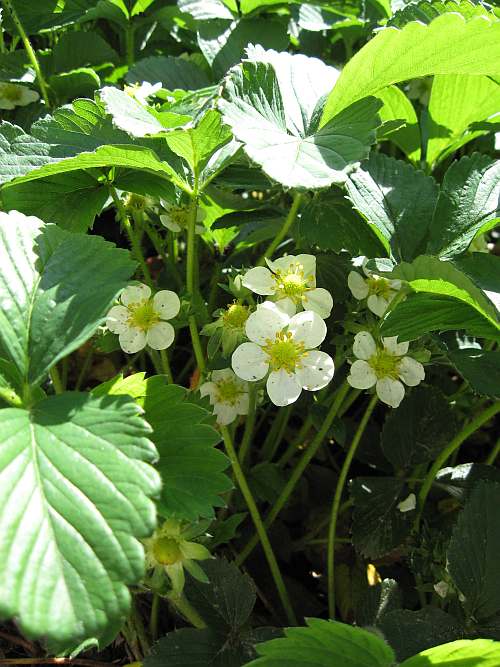 Here is this week’s gardening activity. 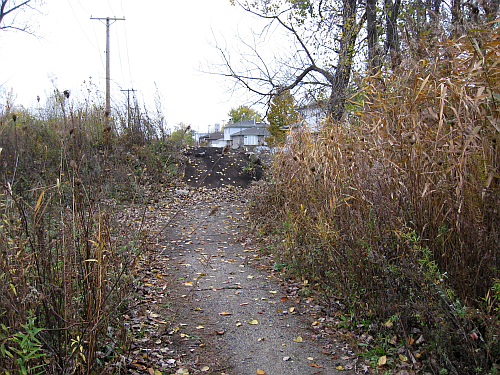 It started with a problem area, the north side of an entrance. Turning the soil proved harder than it looked. It was one huge mass of intertwined roots, with a couple of eight or ten inch concrete blocks buried a few inches down, maybe part of an old porch support. The next problem was where to obtain free plants. 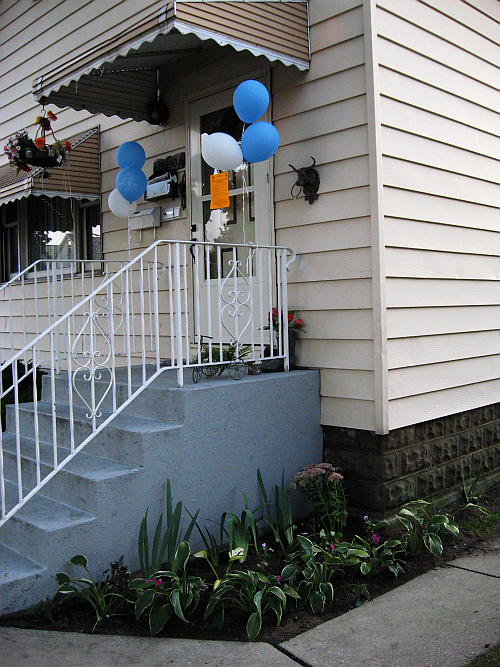 Hostas start at seven bucks for the ordinary kind and go up from there. It’s not my property and I don’t have a budget to work with, so I’ll have to be creative. Time to start another project. 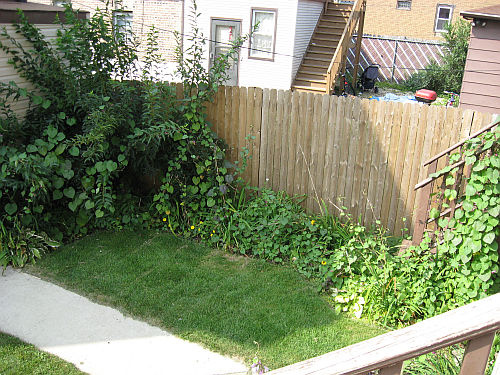 Here is the back yard of where I used to live, that I still take care of in exchange for storage. Looks a bit overgrown. 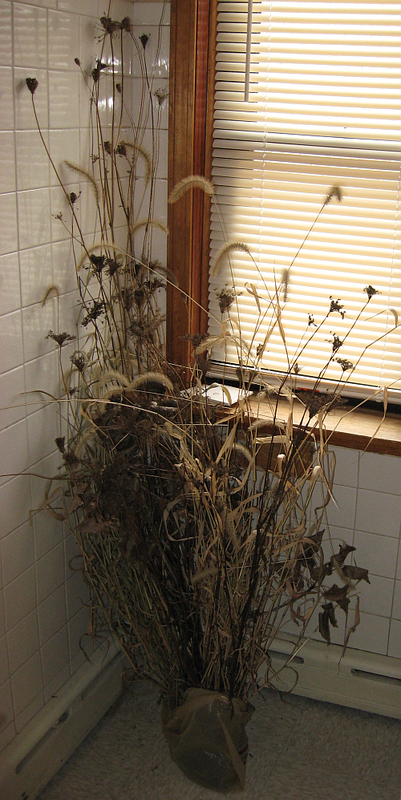 Maybe time to trim things and divide a few plants. 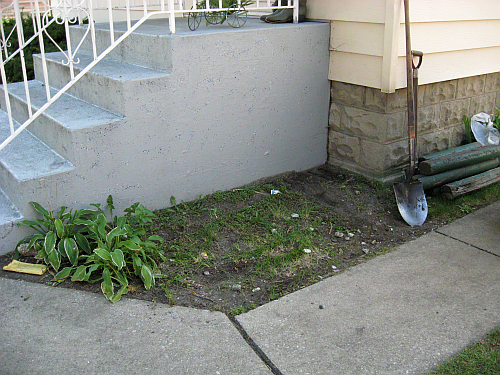 Before I started in on this area, maybe three years ago, it was a poorly growing lawn. 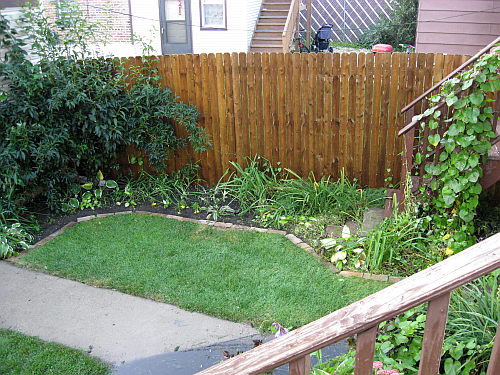 I added a border with plants that I either bought or were gifts from my mother’s yard, and rejuvenated the lawn. 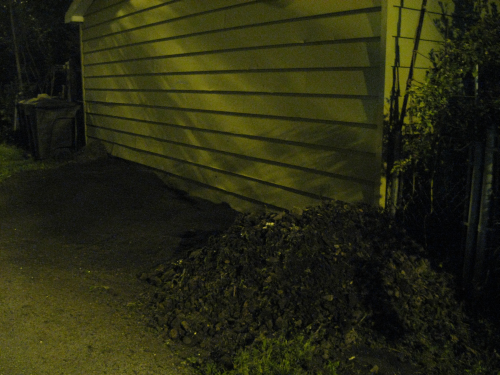 After it’s been cleaned, I have an entire trash bag full of hosta, iris, daylily, and ornamental basil left over. I water it thoroughly, edge the bricks with a spade, and throw some Miracle-Gro foliar feeder on it for good measure. Then it’s back across the street to install the plant divisions in the problem area, with a little peat moss mixed into the soil under each plant. 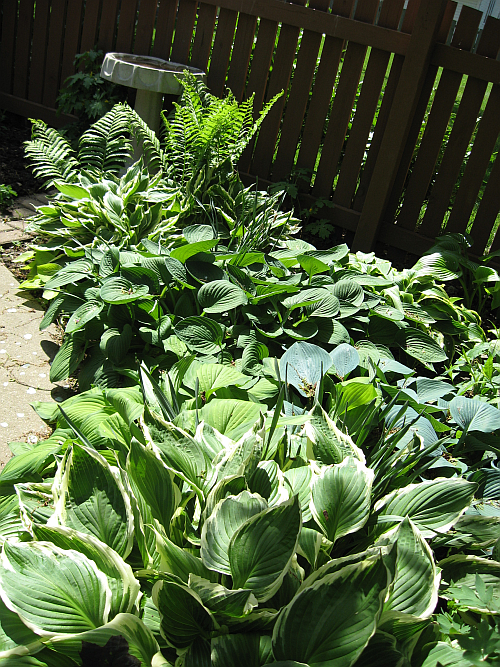 In the front, a row of shade-loving hosta, the ordinary kind with white on the outer leaves. 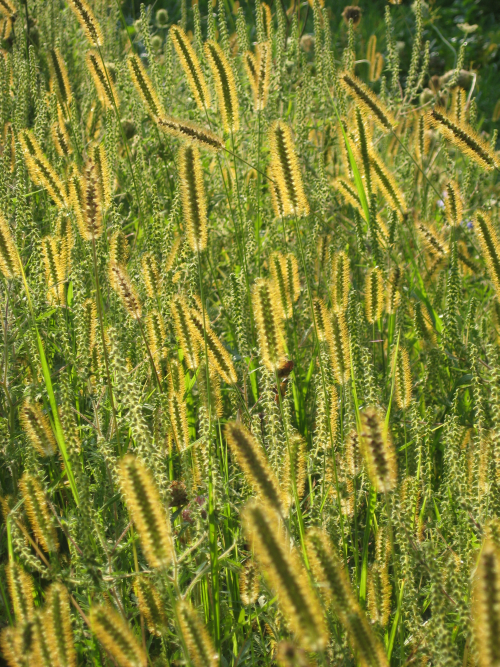 These grow rapidly and there are always enough to divide–in a year one plant will yield two more plants. 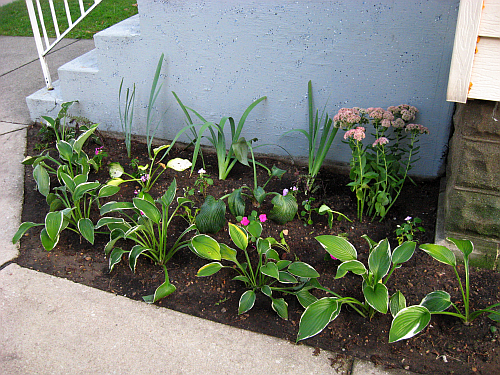 In the middle, a blue leaved hosta and a yellow leaved hosta, interspersed with impatients. The yellow ones looks identical to green hostas until you put them in the sun, then they turn yellow. Impatients grow well here, in either sun or shade, although they do a little better in the sun. In the back are irises and a jade plant, both survive in shade. The soil here is sandy–this was once the bottom of a prehistoric Lake Michigan that was much larger–and the soil drains quickly. Ideally the soil should have four inches of peat moss dug into it, or even compost, but again, I don’t have a budget for this project. Instead I had a little Miracle-Gro infused peat moss left over from some other project and mixed it with the soil under each plant. Hopefully that will help it retain moisture around the root. 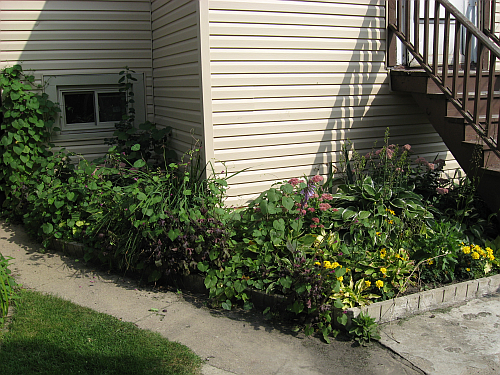 The real purpose of a garden like this is to get perennials established so you don’t have to plant annuals every year. Realistically, gardeners die or move away, but a good established perennial bed will look good even without care. 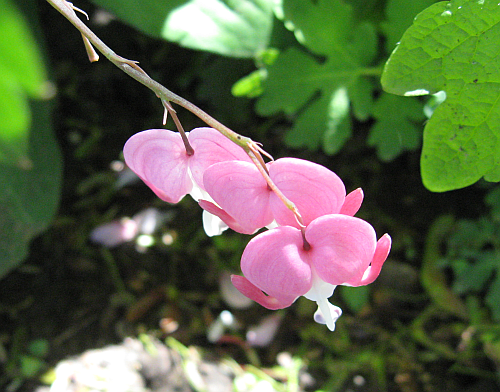 Even though it’s the skeleton of perennials that make the garden, it’s the flowers that people notice and comment on. I find if I include some showy flowers, nobody has much comment about the rest of what I do and I am allowed to proceed without impedance.